When it comes to moving around supplies and furniture, carts make things much easier. Whether you need an ipad cart to store and charge your devices or a table cart for quick banquet setup and cleanup, Hertz Furniture has a great selection to fit your needs and your budget. This is one investment that offers years of convenience and use. From AV carts to utility carts and beyond, if there is something you need to get in and out of storage quickly or move around from room to room, we have what you need to get the task accomplished smoothly. You will be amazed at how much easier it is to get things into place when there is no carrying or dragging involved. The time and stress that you save will be well worth it. What kind of cart can I put AV equipment on? AV carts are perfect for any school or company that relies on digital presentations. They are ideal for projectors that are shared among a number of different rooms. Some media carts even have a pullout laptop shelf which is perfect if you want to project a slideshow from the computer or run any number of programs that can be helpful for classroom instruction or training sessions. What is the easiest way to move chairs and tables? If you have sets of stacking chairs that are used on a regular basis and often need to be rearranged, a chair dolly will definitely come in handy. Rather than having to move chairs individually or find a way to carry or drag heavy loads around, you can stack many seats on a chair cart and easily glide them into the right location. Many models are designed for particular styles of chair, so it is important to make sure that you choose a good fit for your style of choice. Like chairs, tables can be a hassle to move if you don’t have the right equipment. Smooth rolling table carts can make a big difference when it comes to getting a space set up. Whether you are arranging a banquet or conference, having the ability to move many tables and once will save a lot of time, energy, physical strain and frustration. With Hertz Furniture’s great selection of table trucks, you can enjoy this convenient option with tables of many sizes and shapes. 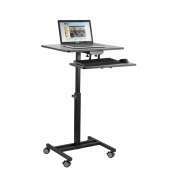 Can I get a mobile computer desk? Computer carts give you all of the space you need for PCs and accessories with the added advantage of mobility. They are designed to accommodate a monitor, CPU and keyboard perfectly so professionals can enjoy a fully functional workspace that is comfortable and attractive. At the same time, mobile computer desks are also designed for maneuverability, so they are more compact than a full-size workspace. Where can you charge and store multiple iPads? 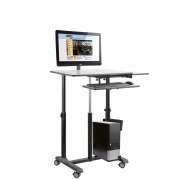 The more technologically-dependant our schools become, the more important it is to equip yours with iPad carts. Any institution that owns a number of devices that need to be used on a regular basis should have an easy way of storing and charging them all together. IPad and laptop charging carts ensure that your tablets or computers are secured and ready to use when you need them. With built-in power strips, individual compartments and ventilated sides for circulation, you can get the perfect setup for your school or office. If you are looking for general supply storage, utility carts are incredibly versatile. Their open, flexible design works well for anything from art supplies to cleaning products. For secure storage, you can even choose models with a locking cabinet. You don’t have to decide whether you want to use it as an art or supply cart, you can simply load whatever you need onto the sturdy shelves and wheel everything easily right where you want it to go. Carts come in handy no matter what you need to move. With a selection of styles to fit everything from banquet tables to AV equipment, you can get a perfect fit for a variety of different furniture and supplies.